Reps. Maxine Waters (D-Gardena) and Judy Chu (D-Monterey Park) are holding a press conference to appeal to California Attorney General Kamala Harris to stop the sale of the non-profit Keiro Senior HealthCare facilities to a for-profit corporation, Pacifica Companies. The event, which is open to the public, will take place on Thursday, Jan. 14, at 10 a.m. at First Southern Baptist Church, 1025 Marine Ave. (at Vermont) in Gardena, across the street from South Bay Keiro Nursing Home. “For decades, Keiro Senior HealthCare has provided culturally sensitive, non-profit health and residency services to Japanese American elderly in the Los Angeles region,” Waters’ office said in a statement. “Now, up to 600 low-income seniors may lose their only quality care due to a pending sale of Keiro to a for-profit real estate developer whose corporate goals are not aligned with the community. “No public hearing was held, no serious conditions were placed on the sale, and no sufficient support was promised to the hundreds affected. For more information, contact Waters’ office at (323) 757-8900. 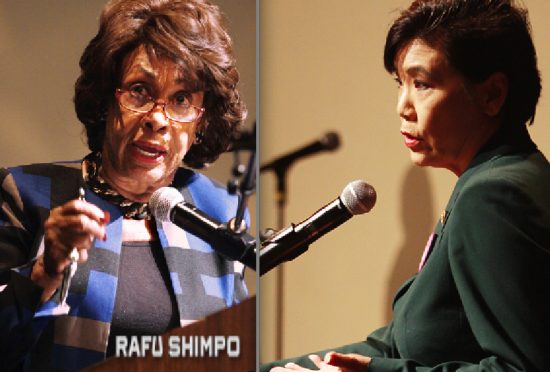 Waters and Chu, along with Assemblymember David Hadley (R-Torrance), spoke at a public meeting held by the Ad Hoc Committee in Little Tokyo in November and were among 16 members of Congress who signed a letter to Harris expressing concerns about the sale. Waters also contacted Harris and facilitated a meeting between the Ad Hoc Committee and representatives of the Attorney General’s Office. In addition to South Bay Keiro, the facilities being sold are Keiro Nursing Home in Lincoln Heights and Keiro Intermediate Care Facility and Keiro Retirement Home in Boyle Heights. Keiro has maintained that the sale is the only way to keep the facilities operating and that adequate notice was given to the stakeholders.